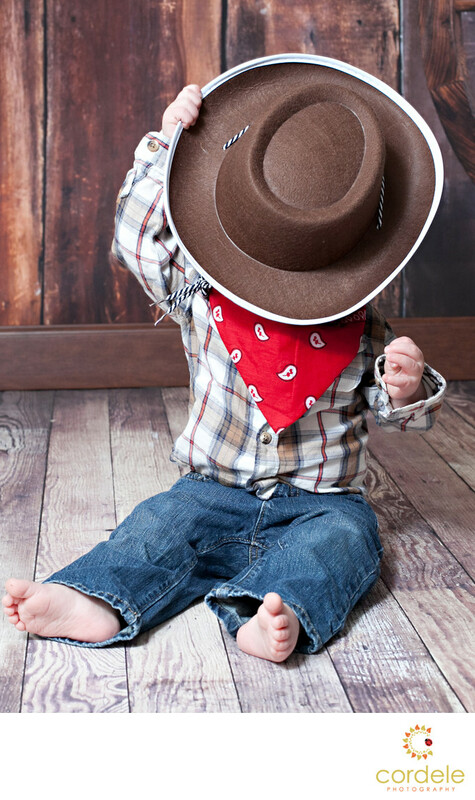 A photo of a baby dressed up as a cowboy hiding behind the hat for his portrait in Reading. This photo was one amazing capture. The little boy was playing with the hat. I wanted to try and get his eyes, but what we captured was even better. I love the red scarf poking out from underneath the rim of the hat. The Blue jeans tie into the plaid shirt he is wearing and having him be barefoot on the wood brings in a country feel to it. Portrait Photos in the studio in Reading MA are some of my favorite to capture. Keywords: cake smash (6), first birthday photos (3).